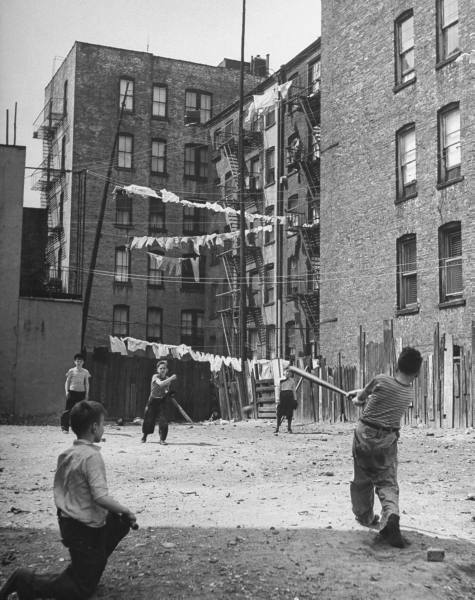 It’s true that we played stickball as a pick-up game, but when our block, Simpson Street, played against the next block, Fox Street, it was no casual affair. Our team did not include the younger kids like myself but only the best of the teen-agers (like my older brother Jake) and guys in their twenties. And money was on the line. I don’t know how much was bet, but even a few dollars in those Depression days was a considerable amount. The big games were played on weekends, when the older guys were off work. Everyone knew about the stickball games but technically they weren’t legal. Every now and then the cops would come around and break up a game. Usually, someone saw them in time so one guy grabbed the broomstick handle and ran up to the roof with it while the other guys scattered. Once or twice the cops had managed to grab the stick, which they jammed into a manhole cover and broke in two. We younger kids usually played punch ball instead of stickball and all the other New York street games, slug ball, curves, off-the-point and, in the proper seasons, touch football, checkers and marbles. We did sometimes play stickball when we could get hold of a broom handle and when the older guys weren’t playing. On this one weekend when for some reason they were short one player Jake told the other guys I could fill in. Some of them were skeptical. “He’s kind of small,” said one. After a few more back-and-forths it was agreed to let me play. I’d bat last, which was ninth, and play in the outfield, way out. So there it was. Our home plate, as Google says, was a manhole cover, or sewer cover, as we called it. Second base was the next sewer cover. First and third bases were on designated cars parked on the street. In some stickball games there was a pitcher but on our block you tossed up the ball and swung, just like hitting fungos in baseball. You could also let the ball bounce, then try to hit it. If you hit the ball out as far as the sewer cover past the second base one you were known as a three-sewer hitter, which was like being a stickball Willie Mays or Joe DiMaggio. In the first couple of innings both teams scored some runs. I couldn’t hit the ball as far as the older guys so I tried to pull the ball to make it go into a cellar, which was a ground rule double. But in my first at-bat, I feebly ground out to third. Then in the fifth inning their clean-up hitter, who Jake had warned me about, came up with the bases loaded. He was a skinny guy, didn’t look like a three-sewer hitter but he hit a long fly ball. I was playing pretty deep but I could see it was going over my head. I pedaled back and thought I was under the ball, but it glanced off the top of my glove. Everyone scored; it was a grand slam home run. Nuts! Our team inched back one run at a time and in the seventh inning I came up with two men on base. This time I managed to hit the ball over the third baseman’s head and into a cellar. A ground rule double and two runs scored. We were ahead with one inning to go. The Fox Streeters had two quick outs and I thought, good, the game was just about over. Then came a couple of hits and an error and suddenly the bases were loaded and once again their skinny cleanup batter was up. I didn’t feel good about this. I moved back, even back further than the third sewer. He swung and this time he hit it high and deep. I judged where it would come down. Years later I’d read the Peanuts comic strip where Charley Brown would be camping under a high fly ball for I don’t know how many days, thinking to himself that he would be either the hero or the goat. Of course, since he was Charlie Brown you know what he wound up as. I didn’t have any such thoughts. I was in position; I was a good fielder; I tapped my glove and the ball came down right into the pocket. I secured the ball with my ungloved hand, a basket catch like Willie Mays. I don’t know if I was the hero, but I’d made the last out. The two cops looked at each other. “Nah,” said one. “Aint worth the paper work.” They kept the ball but gave me back my glove. “Did you see my catch?” I asked Jake. So that was my big stickball moment. After that summer I started playing handball full-time at the schoolyard. In later years, Jake sometimes brought up that stickball moment when, he said, I allowed four runs to score. He said he’d taken a lot of ribbing from his friends for letting me play on their team. I reminded him of my catch the second time around, but he’d always say nobody saw it. This always made me mad, but no matter what I was glad I’d made the catch. Even if nobody else knew, I wasn’t the goat.